The Studying With Dyslexia Blog welcomes a new guest writer today, Ingrid Connors who has some wonderful ideas for supporting the learning process for phonics and spelling. My name is Ingrid Connors. I am a mum of three children, two of whom have dyslexia. I am also a Learning Support Teacher and founder of a phonics programme called Monster Phonics for dyslexic learners. Parents often ask me how they can they can help their child with phonics and spelling at home. Like most good teaching, the answer is to try a broad range of multisensory activities. There is no magic trick - activities that employ several senses and techniques will support memory. Changing up the activities will keep interest high and make the learning enjoyable. 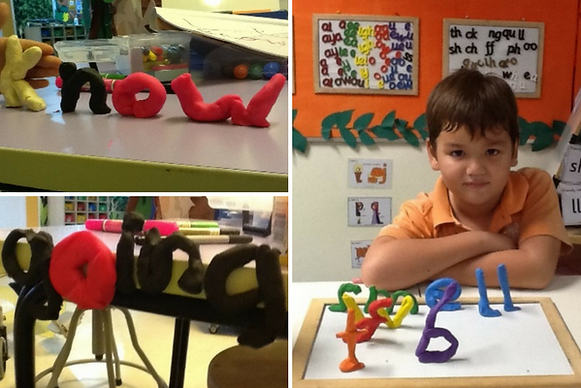 Some children have greater success learning whole words in 3D by ‘building’ playdough 3D words. Choose a variety of colours to make this more fun. The sense of smell can be added to the multisensory diet by including a flavouring such as vanilla or peppermint (but obviously not to eat - smell only) to homemade play dough. The 3D shapes can lie together, flat on the page or if built strong enough, they can stand upwards. To have even more fun with this, letters can be made into characters. Colour-coding helps to identify the key aspects of each word - blue ‘oo’ sound, pink long O sound and red long A sound. Notice the silent ‘h’ and ‘k’. Particularly useful for early learners - characters in words. Salt dough can be used for as long as required. If you would like to make the letters permanent, cook them in the oven, for 3 hours on a low heat so that they don’t burn. Better still, try a microwave recipe that cooks in only 3 minutes! To finish the process, your child can paint the letters in the most interesting ways and finally practice building the word. This is a fantastic way of memorising the letters used – so many actions and senses employed. Finding words within words can be a useful memory technique. For example 'several', 'piece', 'measure', 'repair'. 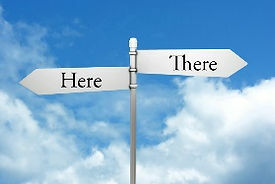 At the same time, encourage your child to say the letters sounds and names and the read the word. Make and remake, noticing interesting features about the shape of the word. 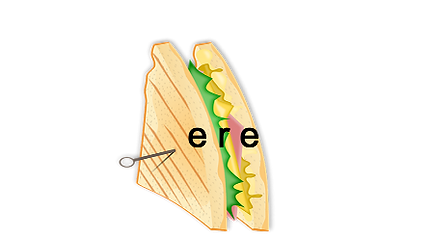 ‘There’ has 2 tall letters to start with; both ‘here’ and ‘there’ have an r sandwich made out of e bread ‘ere’. and visual stimulus. However, it is important to remember that it is another type of multisensory activity, which ideally should be part of a wider multisensory learning diet. Repeated writing of words in the joined script can help children to recall the muscle movements involved in the writing of the word. This not only supports writing but also word recognition. It is easy to make this activity entertaining and that is the key! Using a different colour each time, the resulting ‘rainbow’ writing can be very visually rewarding. Children enjoy choosing different colour combinations to give different visual effects. d) Whiteboard pens and whiteboard or Chunky Chalks and Blackboard. At the end of the day, a combined multisensory approach is most effective. I hope you get chance to try out these activities as I have found them very useful. I am always happy to support so if you have any questions drop me a line on Facebook – I’m in the Parenting Dyslexia Group. Best of luck! Ingrid Connors is the founder of Monster Phonics, a BETT Awards nominated and DfE listed phonics programme for dyslexia. Having worked in education for most of her adult life, Ingrid is an advocate for educational access and dyslexic friendly teaching. Free resources for parents and schools are available at monsterphonics.com.